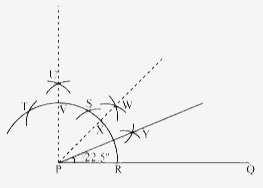 Question-1 :- Construct an angle of 900 at the initial point of a given ray and justify the construction. which intersects PQ at R.
the previously drawn arc at S.
the arc at T (see figure). 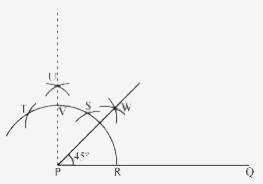 (iv) Taking S and T as centre, draw an arc of same radius to intersect each other at U. 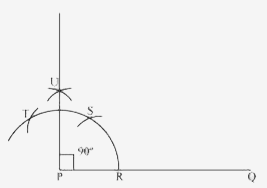 (v) Join PU, which is the required ray making 90° with the given ray PQ. We can justify the construction, if we can prove ∠UPQ = 90°. For this, join PS and PT. 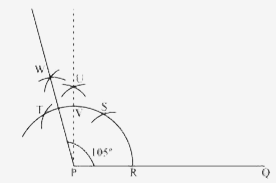 Question-2 :- Construct an angle of 450 at the initial point of a given ray and justify the construction. (v) Join PU. 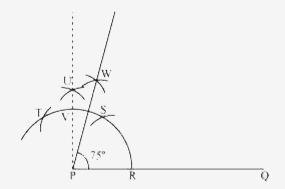 Let it intersect the arc at point V.
(vi) From R and V, draw arcs with radius more than RV/2 to intersect each other at W.
PW is the required ray making 45° with PQ. We can justify the construction, if we can prove ∠WPQ = 45°. We have,  ∠SPQ = 1/2 x ∠TPS = 1/2 x 60° = 30°. 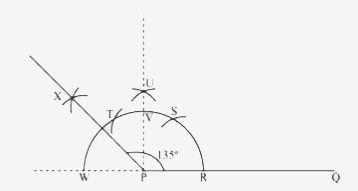 In (iii) and (iv) steps of this construction, PU was drawn as the bisector of ∠TPS. In step (vi) of this construction, PW was constructed as the bisector of ∠UPQ. ∠WPQ = 1/2 x ∠UPQ = 1/2 x 90 = 45°. (I) Draw the given ray PQ. Taking P as centre and with some radius, draw an arc of a circle which intersects PQ at R.
(II) Taking R as centre and with the same radius as before, draw an arc intersecting the previously drawn arc at point S.
(III) Taking R and S as centre and with radius more than RS/2, draw arcs to intersect each other at T.
Join PT which is the required ray making 30° with the given ray PQ. (VI) From R and V, draw arcs with radius more than 1/2RV to intersect each other at W.
(VII) Let it intersect the arc at X. Taking X and R as centre and radius more than 1/2RX, draw arcs to intersect each other at Y. Joint PY which is the required ray making 22 by 1/2° with the given ray PQ. (III) Taking R and S as centre and with radius more than RS, draw arcs to intersect each other at T. Join PT. (IV) Let it intersect the arc at U. Taking U and R as centre and with radius more 1/2 ray making 15° with the given ray PQ. (4) Taking S and T as centre, draw an arc of same radius to intersect each other at  U. (5) Join PU. Let it intersect the arc at V.
Taking S and V as centre, draw arcs with radius more than 1/2 SV. Let those intersect each other at W.
Join PW which is the required ray making 75° with the given ray PQ. radius more than 1/2 TV. Let these arcs intersect each other at W.
Join PW which is the required ray making 105° with the given ray PQ. some radius taking point P as its centre, which intersects PQ at R and W.
(4) Taking S and T as centre, draw an arc of same radius to intersect each other at U.
more than 1/2 VW, draw arcs to intersect each other at X. Join PX, which is the required ray making 135° with the given line PQ. Question-5 :- Construct an equilateral triangle, given its side and justify the construction. Let us draw an equilateral triangle of side 5 cm. We know that all sides of an equilateral triangle are equal. Therefore, all sides of the equilateral triangle will be 5 cm. We also know that each angle of an equilateral triangle is 60º. while taking A as its centre. Let it intersect AB at P.
(II) Taking P as centre, draw an arc to intersect the previous arc at E. Join AE. (III) Taking A as centre, draw an arc of 5 cm radius, which intersects extended line segment AE at C.
Join AC and BC. ∆ABC is the required equilateral triangle of side 5 cm. 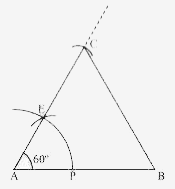 We can justify the construction by showing ABC as an equilateral triangle i.e., AB = BC = AC = 5 cm and  ∠A =  ∠B =  ∠C = 60°. In ∆ABC, we have AC = AB = 5 cm and  ∠A = 60°.